Small footprint, low cost check reader with high accuracy and dependability. The MagTek Mini-MICR Check-Stripe Reader reads checks in various formats, read magnetic stripes in various track combinations, come with either a Keyboard wedge (PS/2 or AT) or RS-232 interface, and are available in either white or gray finish. Keyboard Emulation Software Interface: Data is sent as if it were a USB keyboard. Read data can be viewed in applications such as Windows Notepad without requiring additional drivers or application programming. Human Interface Device (HID) Software Interface: A developed or modified application is required to communicate with this device. Data will not be seen in applications such as Windows Notepad. USB Swipe & Insert Reader Demo Program can be used to communicate with the USB SureSwipe Swipe Card Reader. Keyboard wedge interface, format 1100 check reader. Includes tracks 1, 2, & 3 MSR. Order cables separately. See accessories. Color: gray. RS-232 interface, format 0200 check reader. Includes power supply & tracks 1, 2, & 3 MSR. Order cables separately. See accessories. Color: gray. Keyboard wedge interface, format 1600 check reader. Includes tracks 1 & 2 MSR. Order cables separately. See accessories. Color: white. 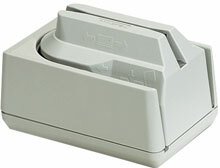 Keyboard wedge interface, format 1100 check reader. Includes tracks 1, 2, & 3 MSR. Order cables separately. See accessories. Color: white. RS-232 interface, format 0002 check reader. Includes power supply & tracks 1 & 2 MSR. Order cables separately. See accessories. Color: white. RS-232 interface, format 0200 check reader. Includes power supply & tracks 1, 2, & 3 MSR. Order cables separately. See accessories. Color: white. Keyboard wedge interface, format 0001 check reader. Includes tracks 1 & 2 MSR. Order cables separately. See accessories. Color: white. Plug it and start processing your checks. Used one for over 10 years with zero downtime. I replaced it with the same model for its ease of use and reliability. USB interface cable, 6 ft. for MiniMICR. Pricing is for the cable when purchased in combination with the MiniMICR unit. If you are purchasing ONLY the cable, please purchase (Part# 22517583ONLY).